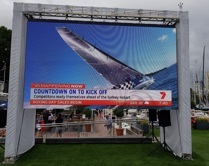 Whatever the results of the Rolex Sydney Hobart 2018, one thing is certain - when the race starts at 1300 AEDT on Boxing Day it will capture the imagination of sailors and spectators worldwide, as some 600,000 people converge on Sydney Harbour foreshore and millions more tune into the action on TV and online! When the fleet for this year's race jostles for position on twin start lines just north of Shark Island, you'll want to be in prime position yourself. To get the full dose of race atmosphere you need to grab a spot on North or South Head, or even join the action on the water among the colourful spectator fleet (which includes craft of all shapes and sizes from ferries to kayaks and even the odd water taxi). But if you're not lucky enough to be there in person when the starting cannon fires, don't worry - there are plenty of ways to follow the race, no matter where you are. JUST ANNOUNCED: The CYCA has added a second spectator vessel for the start on Sydney Harbour. If you've got access to a boat then you can be on the water with the fleet for the start of the race. Spectator craft positioned in the eastern channel can watch the race begin and then follow the fleet down the harbour to the Heads and out to sea. Once underway the fleet can move fast, so if you want to catch the leaders sail through the Heads, it's advisable to get well down the harbour towards Middle Head before the start. At the Heads keep well clear of the rounding marks. If you only plan on watching the start, and don't wish to follow the fleet, then stick to the western side of the harbour. 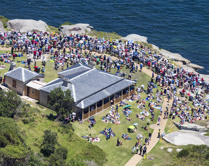 Good vantage points for spectator boats include Taylors Bay, Chowder Bay, Obelisk Bay and North Head on the west and Rose Bay, Watsons Bay, Camp Cove and South Head to the east. The harbour will be very crowded and traffic can be chaotic so stay alert, follow the advice of race officials and remember to keep well clear of the exclusion zone between 12pm and 2pm. For further information please contact CYCA reception on +61 2 8292 7800 or email reception@cyca.com.au. To book online, click here. The Seven Network, through 7Mate, will once again broadcast the start of the race live around Australia. ABC TV will also be following the fleet down the eastern seaboard and provide all the in-race news footage that is used by the various Australian and International news networks. For those who can't get to watch the live broadcast of the start of the Race on the Seven Network across Australia, Seven West Media will webcast the program. You can also watch a webcast of the live broadcast on the home page of the Rolex Sydney Hobart Yacht Race website. If you miss the live webcast, don't worry, a replay of the start programme will be available on this site, and our friends at Seven West Media will be making a replay available shortly after the live webcast concludes and will be available for the duration of the race. Included on the website is the complete list of yachts entered, along with a photograph and description of each boat, a crew list, and the boat's performance data, predicted finishing time and standing for both Line Honours and Handicap Division which is updated every 10 minutes. There's also archival data including results of past races since the first in 1945, the weather they encountered; a summary of line and overall handicap winners of those races; historical reports and statistical information; designers of those line and overall winners; and profiles of some of the race luminaries over the years. The Yacht Tracker page allows viewers to track the entire fleet or a particular boat from start to finish. Yacht Tracker uses a specially designed tool that calculates the predicted results for each and every boat in the fleet, so you can see how each boat is performing. Each yacht will be fitted with a tracker that will obtain a position using the GPS satellite network, and then transmit that position back to HQ using the Iridium satellite network. To do this, the tracker is configured to automatically update the yacht's latitude, longitude, course over ground and speed over ground - and transmits that information via satellite to a land station. From there, the data is transferred to the website, which shows in text and graphics each yacht's position in the fleet, its place relative to other boats and known geographic features, and the speed currently being achieved over the land, as well as the direction in which the boat is sailing. Viewers may view the yachts on a chart through Yacht Tracker or separately on Google Earth. Line honours and progressive predicted corrected times under the IRC, PHS and ORCi handicap categories are updated every 10 minutes. The Cruising Yacht Club of Australia recommends using public transport when visiting the club, especially in the lead up to, and on Rolex Sydney Hobart Yacht Race, race day, 26 December. Please visit the Transport NSW website to plan your trip to the CYCA, at 1 New Beach Road, Darling Point. CYCA is a one kilometre walk from Edgecliff Station, which lies on the T4 Eastern Suburbs and Illawarra Line. Alternatively, it is a 1.3 kilometre (15 mins) walk via Bayswater Road from Kings Cross Station. CYCA is situated within 150 metres of bus stops on New Beach Road, which are serviced by Route 328 between Bondi Junction and Darling Point. It is also located within 100 metres of bus stops on New South Head Road that are serviced by Routes 324 and 325 between the City and Watsons Bay. 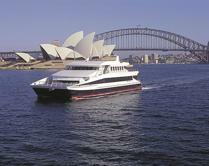 CYCA is a one kilometre walk from Double Bay wharf, which lies on the F7 Eastern Suburbs Line. On 26 December only, the drop-off/collect point will be located opposite the club on New Beach Road. At all other times taxis and rideshare cars can pick up and drop off outside of the club. A taxi booking phone is located within the club itself.